Now we get to enjoy BBQ without having to go outside and stand over the grill in the heat of summer. Just five minutes of effort and 2 1/2 hours in your slow cooker yield chicken so juicy and tender, you might not go back to grilling! 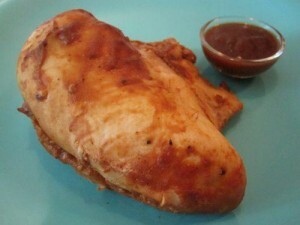 And this recipe is actually a three-in-one: throw in an extra breast or two to make BBQ chicken quesadillas, and save some of the juice to make shreddded BBQ chicken sammies. Serve, and save the juice from the bottom of the pot if you want to make Shredded BBQ Chicken Sammies.